Love is in the air with the day of love coming up soon this February. It is indeed a lovely time to spend a romantic getaway together to the tropical paradise of Bali. Bask in the sunlight, enjoy the famous Balinese spa and end the day with a romantic dinner together. 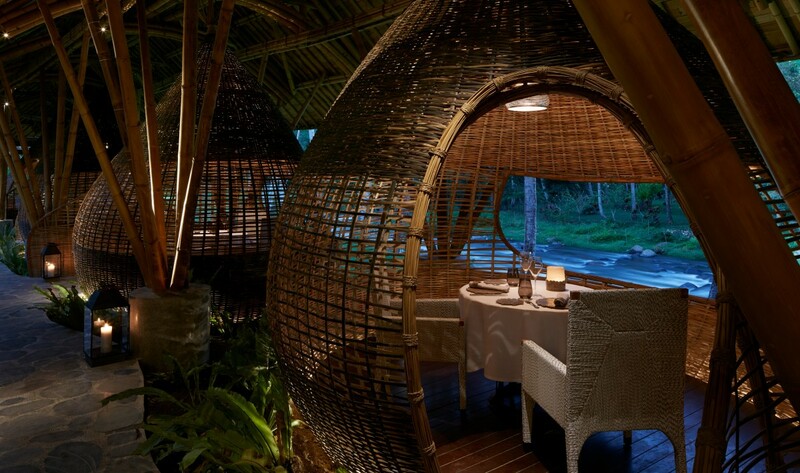 Mandapa, A Ritz-Carlton Reserve, offers this and more for an extraordinary Valentine’s experience. Indulge in the Ultimate Romance Package, exclusively designed for couples longing for a romantic getaway in the cultural town of Ubud. 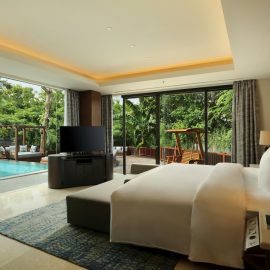 Embark on a minimum 3-night stay in a one-bedroom pool villa (rate starts from IDR 16,500,000++ per night) which includes Romantic Dinner for the couple (choice of location: rice field, the cliff or in-villa), Rempah Ratu Raja – a 150-min spa treatment, one-time Classic Vintage tour, daily breakfast and return airport transfer. 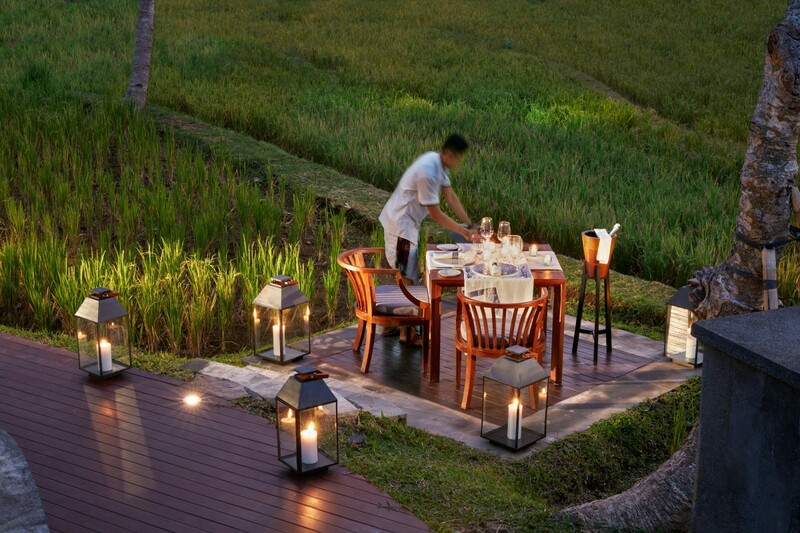 Mandapa, a Ritz-Carlton reserve also offers romantic Valentine’s day dinner at Sawah Terrace and Kubu. 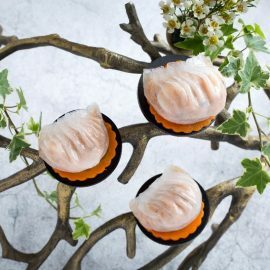 Experience Sawah Terrace’s blend of class and nature for an exotic and unforgettable Valentine’s day. 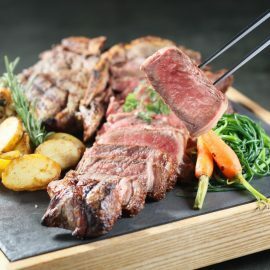 The best Indonesian-inspired six-course menu including lamb loin with aromatic broth, red snapper in woku sauce and charcoal grilled wagyu beef short ribs will be served to accompany your night for only IDR 950,000 per person starting at 6 p.m.
Dine and luxuriate in an amorous evening at Kubu, a riverfront cocoon surrounded with dim lighting and the sound of water flowing through. 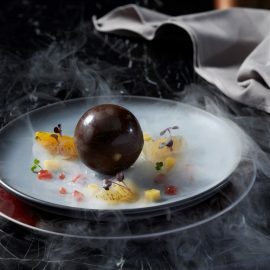 Chef’s Bayu Timur’s delectable six-course menu includes Iranian mud crab and cray fish, roasted pigeon with foie gras croquette, Black Angus beef tenderloin and Strawberry Sphere Delight will enhance the amorous vibe of the night. 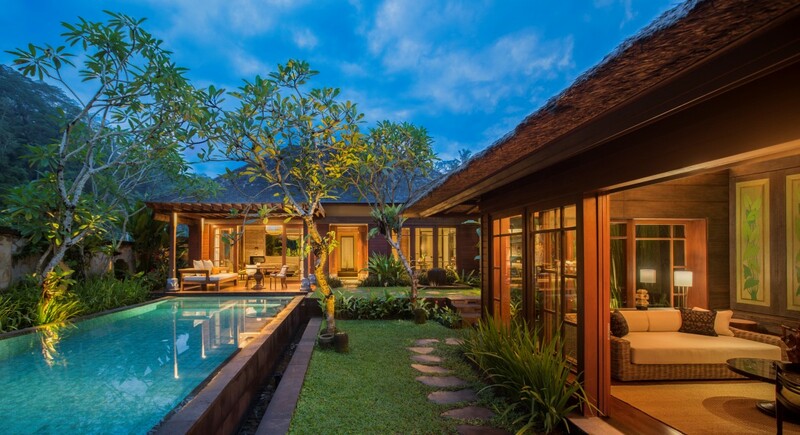 Enjoy this exclusive experience (limited seats, advance reservation is required) for IDR 1,350,000 per person which starts at 6.30 p.m or 9.30 p.m.
Indulge in the perfect romantic getaway in Bali’s cultural heart of Ubud at Mandapa, a Ritz-Carlton Reserve. The excellent blend of luxury, elegance and nature makes it the perfect place to spend the Valentine’s day with your special someone.